A few days ago I told you guys that Google Chrome will soon let you change background images, most probably from the same source as Chromecast backdrops. A code commit that I noticed today talks about an additional option to this background images feature. 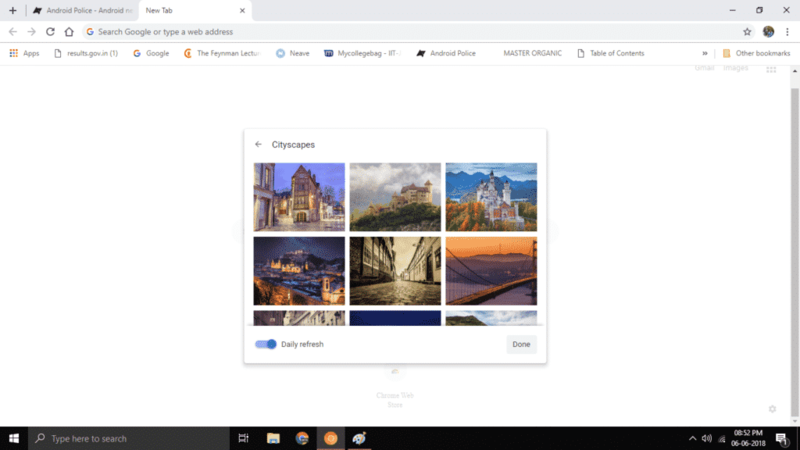 When this feature is live, you will be able to select a picture from your own computer and set as new tab page background. the site doesn’t have access to the full path of the selected file. Instead convert the image to a data URL and set as the background URL. Just like your Chromebook wallpaper, you’ll be able to select a custom image as your Chrome’s new tab page wallpaper. I am assuming that in the future, or maybe at the launch itself, these custom images will sync across devices. That will be really cool. You can set an image as background from a computer and voila, you’ll get the image backed up via your Google Drive account and synced across your other devices. Of course, we will have to wait for some more time to see this in action. I already have the gear icon at the bottom right corner of my new tab page, but this isn’t working yet. Looks like they need to turn something on from the server.